With only a few weeks left until WayHome Music & Arts Festival takes over Burl's Creek in Ontario, Canada, the anticipation is high as the festival released daily set times and the lineup for the Perrier Greenhouse. 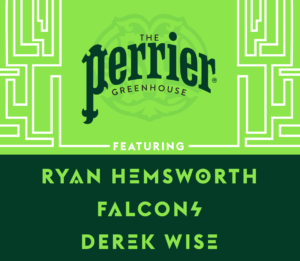 The Perrier Greenhouse will feature headliner Ryan Hemsworth alongside FALCONS and Derek Wise. The Greenhouse will also showcase locals JAYEMKAYEM, Killa Kels and Tommy Kruise. The activation will include custom cocktails, air conditioning and more. WayHome has also released the always anticipated set times for the festival. Artists have been meticulously scattered among the three stages: WayHome, WayBright and WayAway. The festival has managed to beat the dreaded "set time overlap" by giving attendees enough time to bounce around from stage to stage. Electronic music lovers will have to beat daylight and exhaustion as the majority of the EDM acts are slated past midnight. For a full list of set times, head to the official WayHome website. WayHome will also have activations on site featuring the Coors Light Hot Air Balloon, TOPSHOP and TOPMAN artist-themed rooms for the ultimate social experience and installations from artists within the Toronto-area. Weekend and single day passes are available and can be purchased via WayHome's website.